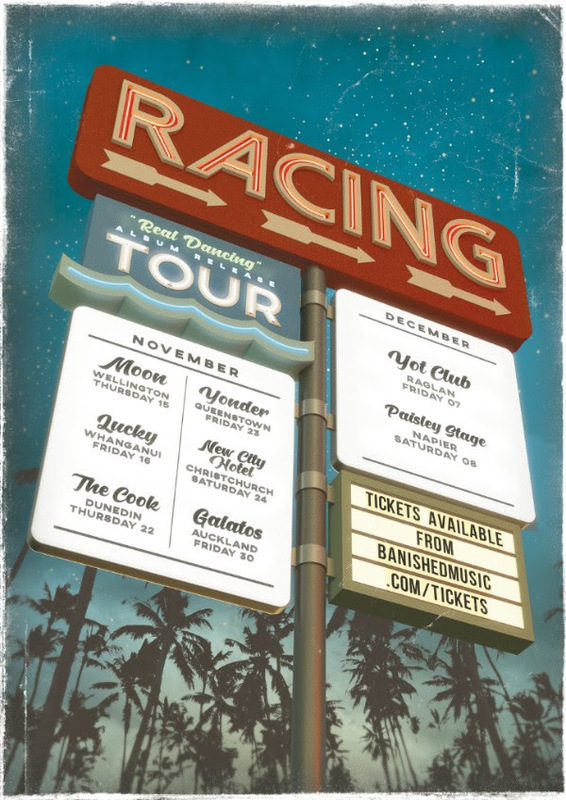 Racing are set to release their new album Real Dancing on Friday November 9th, and to celebrate the band are launching out across New Zealand for an eight-date tour. ‘Real Dancing’ is a bustling night market of spicy grooves, smokey vocals, strange lyrics and venomous guitar tones. Together these create an intoxicating and intriguing atmosphere that rolls and simmers throughout the record. Born of early hour cocktail bars in rural New Zealand or black ice drives through the Desert road, Real Dancing captures the wild and vivid journeys that the band live while touring. This album is filled with an epicurean sensibility, Patron Anejo soaked discoesque grooves, lurid crooning and a love of the road. The album contains a string of hits, with its lead single ‘Motel Pool’ topping the NZ rock airplay charts and holding its top 10 status for a whopping 32 weeks. Other tracks ‘Devil’s Work’, ‘Misbehaving’, ‘The Bass’ and new single, ‘Party Slow’, have also received strong airplay across New Zealand.